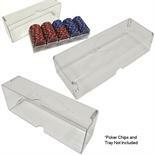 Chip racks are the perfect poker and gaming table accessory. Poker table chip trays are used to store poker chips and playing cards. You can either sit them on top of a poker table or you can have it built into a poker table. Many different size and shapes. 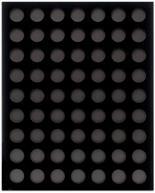 Use it to store your chip racks or use them on the poker table to hold your chips. Stackable racks are also available. 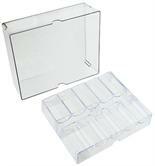 Looking for Replacement Chip Trays for your table or table top? Please click on this link >>> replacement poker table chip trays. Perfect for Home & Casino Play! Perfect for Home Tournament Use!